IRVINE, Calif.–(BUSINESS WIRE)–CoreLogic® (NYSE: CLGX), a leading global property information, analytics and data-enabled solutions provider, today released data analysis showing insured property losses for both residential and now commercial properties from Hurricane Florence. 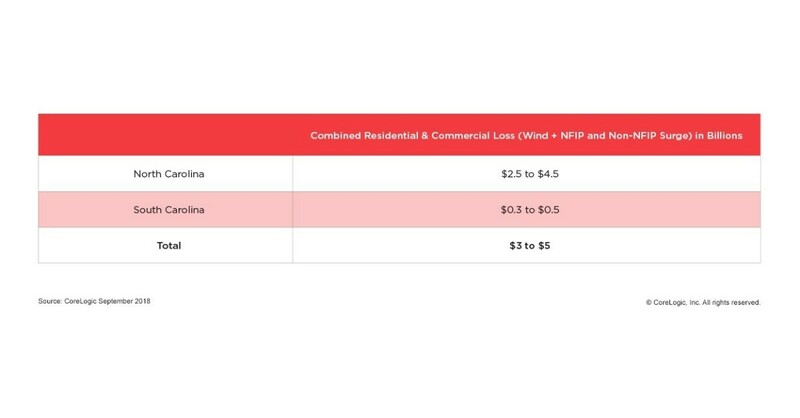 This new analysis estimates between $3 billion and $5 billion in losses which has been expanded to include wind and storm surge. This does not include insured losses related to rainfall, riverine or other flooding since the full rainfall footprint is an element in factoring total losses. Hurricane Florence is expected to make landfall along the North Carolina and South Carolina coasts. In particular, 250,000 homes in North Carolina are projected to be affected by the hurricane. The following numbers have been refined based on the September 13, 8am PDT National Hurricane Center (NHC) track of the storm and the cone of uncertainty. The table above shows the estimates for commercial and residential insured property losses by state in North Carolina and South Carolina. It does not include National Flood Insurance Program (NFIP) inland flood losses (only storm surge related NFIP flood losses) as it is too soon to tell what the potential rainfall, riverine, and other flooding will amount to in order to tabulate losses for that peril. The CoreLogic North American Hurricane Model includes advanced location risk and estimation through its robust stochastic event set, high-resolution hazard modeling, component-level vulnerability, and usage of PxPoint™, the parcel-level geocoding engine. The model provides the ability to calculate damage and loss contributions from storm surge, providing a transparent way of looking at loss as well as to obtain a better understanding of capital adequacy for the separate or combined perils of hurricane winds and coastal storm surge flooding. The model offers a complete view of the risk for all perils and sub-perils. The North Atlantic Hurricane Model is updated biennially and has been certified by the Florida Commission Hurricane Loss Projection Methodology (FCHLPM) since the inception of the process in 1997. Source: CoreLogic The data provided are for use only by the primary recipient or the primary recipient's publication or broadcast. This data may not be resold, republished or licensed to any other source, including publications and sources owned by the primary recipient’s parent company without prior written permission from CoreLogic. Any CoreLogic data used for publication or broadcast, in whole or in part, must be sourced as coming from CoreLogic, a data and analytics company. For use with broadcast or web content, the citation must directly accompany first reference of the data. If the data is illustrated with maps, charts, graphs or other visual elements, the CoreLogic logo must be included on screen or website. For questions, analysis or interpretation of the data, contact Alyson Austin at [email protected] or Caitlin New at [email protected]. Data provided may not be modified without the prior written permission of CoreLogic. Do not use the data in any unlawful manner. This data is compiled from public records, contributory databases and proprietary analytics, and its accuracy is dependent upon these sources.